Performances are held May through December. 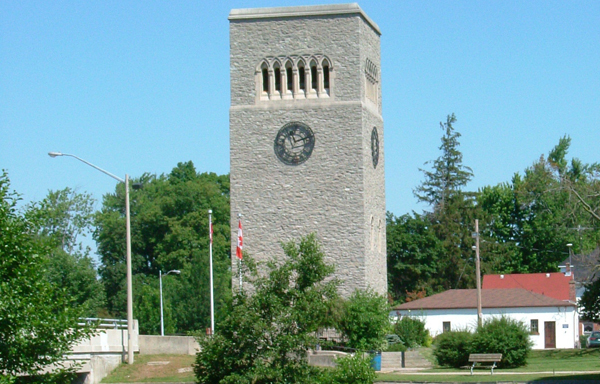 Relax and enjoy the free, 23 bell Carillon performances in Simcoe’s down town park system along the Lynn River. This is the second carillon installed in Canada. Built to honour Norfolk’s War heroes, it was dedicated on June 17th, 1925. The Norman architectural style stone tower is 60 feet high and contains 23 bells. The heaviest bells is 1,568 lbs, the smallest is 60 lbs. The total bells’ weight is 8,561 pounds. Coordinated by the County Carillonneur—Jim Nicholls—22 volunteers play nine months of the year on a regular basis. They also undertake special performance for Remembrance Day ceremonies, Friendship Festival and Panorama. Guest concerts are presented periodically.